The 2014 Zodiac Pictograph: Like last year, focus on how to harmonize with the opportunities for each sign, and how to stay centered. Last year was a very mixed and intense year for many, although I surely wrote some sunny, sugar-coated horoscopes for people. Well, these 2014 horoscopes are also pretty sunny, but in this plucky but extreme year, people are in kind of an "up" place about themselves. You have more energy this year, come back to your center, have more primordial urges, and generally feel it to be a freeing year. You're very, very happy about feeling like you're in a place creatively and in terms of location that you belong. You see the potential for a revival of business - you see how you can be successful in new ways, and ways that are true to you now. You're strongly more ambitious, perhaps with a new idea of professional success. The first part of 2014 could be a little tough, where you're aware of obstacles to moving forward. Don't give up if the beginning of the year isn't a professional, financial success. You are coming up with the ideas that are really going to work, and it's a process, and by the end of the year you're in a much better position. You ask yourself, "Where am I comfortable, and what makes me feel at home?" ! Dissatisfaction may have you considering big changes, but who cares how they come about? The changes are good, appreciated by you on many levels, and settle you, metaphorically or literally, in a better place. In some way you may be dissolving an old life, and it could be that the grass truly is greener on the other side. Be willing to explore this questing year! Cancerians can be concerned about an ability to make money doing what it is they love or want. You may be developing new ways of working, as if some are no longer viable or yielding as they've been. This year you have some of your best ideas yet, and at least one is a real winner. Be bold! Also, believe you can find the time to treat yourself well. Speaking of which, you can come into some money. Or, new ways of making better money. Offers tend to improve your salary. Travel can be involved. No matter what your financial situation, a winning priority is to take better care of yourself than ever. You leave a lot behind on your path to success this year. You experience a lot of change around you, and see dreams fulfilled in different ways than you expected. The first half of the year is more of a preparation; you might be back to the drawing board developing new forms and formats, so you can move ahead once again. Whatever you want to do requires a lot of effort. Your skills and talents will be needed, don't worry! Are you up for a more responsible position? Yes! It's a year where you are idealistic, motivated, finding new income streams, and considering coming out with something new. However, you have to leave behind quite a bit, and go through the obvious changes life points out to you, to be the powerful and effective person you can be. You have some new ideas about your possibilities and consider changing your environment, something you should be happy about because it opens up your life. It's a year of transition and new dreams. You are seeing how you could fit into different worlds. Change is good for you! If your life stays in place and nothing much changes externally, you might go out in the world in a more virtual, abstract way: learning about foreign environments, or including new interests. Somehow, you gain new perspectives in 2014. You're on your own in some way, most likely in August. Finances: Do not count your chickens before they're hatched. You're having more fun! A new idea you're hesitant about gets easier to act on mid-year. All in all, your year is successful, positive, clarifying and healing. Librans see success that's been a long time coming so it is in multiple areas, wherever and whatever you've been working on. You have good signs for a communication project such as writing or directing people in some way. You find tasks and work they are well-suited for. Personal areas are resolved and settled before relationship becomes the focus. You make a better adjustment to life. You're empowered to work or join society in a meaningful way...you get to do what you want out in the world. Your imaginings about love have higher aims. You can wish for and want more in the relationship department - you gain confidence about having more love. You can get yourself set up in a concrete and practical way so that you can incorporate more of the world into your life through travel and work; you're organizing yourself better for the future. Lots of personal growth this year! Self-confidence grows, and you see a lot of change. Collaborations and travel are enriching. Where you have arrived enables you to get things done with other people. However, there might be something more "expensive" than it first appears: there's more involved in it, and happiness and sadness are combined in one package. There's a silver lining if something doesn't work out: its replacement works much better. You rush towards new things mid-year. There is a crowning in some way of your abilities, or they can come together in a project that express you more completely and successfully, and in the right role. There's something more right about your projects this year, and they can lead to financial security. Right now you're seeing what you've got...this year shows you that. Heed the earth message about investing early in improvements. Offers can come through that have been pending or projects in the works for a long time. Your mind is on fire! Collaborations are favored. You get fresh starts and second chances. Keep everything in check but your creativity. In 2014, Aquarians can have a new story. You experience a rise in consciousness or better conditions in which to operate. You're able to walk away from things with greater ease than before. Like many signs, a lot of change and improvement this year! There's new work: you can come up with a new idea, plan, or venture, and you have a lot of good supportive ideas for it. You're on a new journey this year. Something that may have been stalled or that you've gone back and forth about (that represents quite a departure and gives you peace of mind) is back on in 2014, so that you can continue thinking and dreaming about what represents a higher octave of your life. Somehow you become more "fit for love" and this can even be physical. If with a partner, you become a better, more admirable mate in the eyes of your mate. You will be motivated to keep on taking care of yourself, and you get better at it. Elissa's website offers a free monthly newsletter, guided meditations, essays on metaphysical subjects, and personal guidance. www.ElissaHeyman.com. 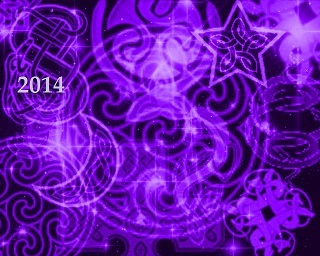 You can sign up for Elissa's Monthly Psychic Newsletter here.